3.8 out of 5 based on 60 bloggers and 27 commenters. 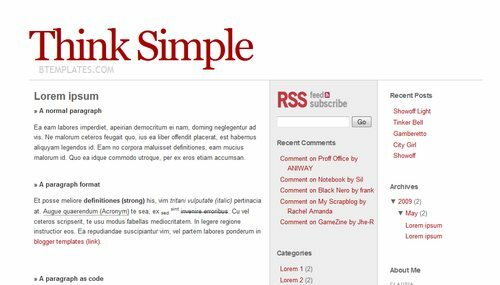 Think Simple is a free premium blogger template with 3 columns, right sidebar, minimalist and neutral colors. This is a really well designed minimal template, thanks Klodian! There were some minor glitches that needed fixing to get it running properly in IE. I could not fix all, e.g. the subtext below the header I cannot get to work in IE. It has been disabled for now. Btemplates is the best free blogger templates. Thumb up! Really nice Template! Thank you so much. How can I get the Navbar back in this template? Is there an easy fix to the ie header? Nope, I have tried, but sometimes I dont understand IE. You can remove blog description text, and will look OK.
what a perfekt template! THANK YOU!!! I read all the answers… but have I understood that right, that there is no way to put the “description text” below the Headline?? This is the best template I have seen so far!!! Congratulations!!! Cual es la fuente que usaron para el boton del RSS? OK, how do I change font color and fonts on this template? I’ve tried the Blogger template, I’ve tried forcing the coding. I want something other than red and gray. Help. I like the COMMENTS FORMAT in the live demo, but when I installed it, it showed the regular comments format in blogger. Is there a way to tweak it? it’s very nice and simple template for blogger, keep good work !